Opening Lines: "She wanted only to sleep." "Lincoln Rhyme, ex-head of NYPD forensics, was the nation's foremost criminalist, the man who could work a crim scene and come away with a perfect profile of the killer, frozen in time. Now, Lincoln is frozen in place—permanently. An accident on the job left him a quadriplegic who can move just one finger, a great mind strapped to his bed, mulish and sarcastic, hiding from a life he no longer wants to live. "Until he sees the crime-scene report about a corpse found buried on a deserted West Side railroad track, its bloody hand rising from the dirt. It belonged to a man who got into a cab at the airport and never got out. Reluctantly, Lincoln Rhyme abandons retirement to track down a killer whose ingenious clues hold the secret to saving his victims—if Rhyme can decipher them in time. "The search leads him to the Bone Collector, whose obsession with old New York colors every scrap of evidence he leaves for Rhyme and his new partner, Amelia Sachs, whom he drafts as his arms and legs. But she's never worked a crime scene in her life—and he can only whisper in her ear as she does the exacting work he lvoed more than anything else." Thoughts: On my seventeenth birthday, my parents (my mother was rather reluctant) took me to see The Bone Collector. My mother sat through the whole movie with her hands covering her eyes, and my father and I were riveted. I loved the movie. I loved the combination of Denzel Washington and Angelina Jolie. However, I kind of lost track of the movie. When HBO started airing it this past December, I decided to read the book. Luckily, the local library happened to have a copy of the book! Unfortunately, since I've been battling a nasty virus, it has taken me a long time to actually finish the book. While walking her last beat, dispatch sends Amelia Sachs to the scene of a supposed crime. What she finds is a mutilated hand rising from the ground. Falling back on her academy training, she immediately seals of the area in hopes of preserving the scene and keeping any physical evidence intact. Since there is a UN conference in NYC, her boss is quick criticize her actions and dismiss her concerns. However, once the case is brought to retired Lincoln Rhyme, her quick thinking brings her to the forefront of his mind. And, even though she is a beat cop about to be transferred to Publication Relations, Rhyme wants her to be his arms and legs while walking the grid as they chase an unsub that could be a serial killer. I loved the character development in the book. With little things like Amelia's love of fast cars and her nervous habit of picking at her fingers, he was able to make the character believable and three dimensional. Further, it was neat to see how Rhyme and Amelia were able to grow through the book, and, in some ways, become different/better people. After suffering from a debilitating accident, Rhyme was struggling with his new role and had a hard time finding a place in his life. Through the work on the case and his connection with Amelia, he was able to recapture some semblance of life. It was very neat to see him go through the change. The way it was written, as a reader, I felt much closer to the character. The law enforcement jargon was awesome! When they talked about running prints and car plates through NCIC, I got excited. After working emergency dispatch for awhile, it was nice to be able recognize some of the lingo and know what they were talking about. That being said, however, a lot of the things were never fully explained and could easily cause confusion. 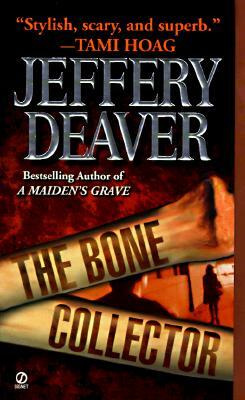 Even though Deaver had a lexicon in the back of the book, I felt he didn't do a good job having entries in it to explain all of the things he was discussing through the course of the novel. The novel was suspenseful and kept me on the edge of my seat. Several times I found myself staying up way too late reading "just one more page." If you're reading this because of the movie, they are different. Some of the crimes are similar, but there are a lot that were left out of the movie. The motivation behind the killings is not the same, Amelia has a different last name and looks different, and so on. That being said, I still loved the book!